Home > Academics > College of Arts and Sciences > Philosophy Department > Faculty > Richard Klonoski, Ph.D.
Richard J. Klonoski earned his B.A. in philosophy and English from the University of Scranton in 1974, an M.A. in philosophy from Kent State University in 1976, and a Ph.D. in philosophy in 1983 from Duquesne University. Among Dr. Klonoski's many scholarly interests are Ancient Greek philosophy (esp. Plato and Aristotle), ethics, business ethics, phenomenology, political philosophy, and philosophy of education. 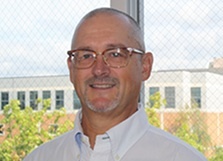 Dr. Klonoski has taught courses in these areas and many others in the University of Scranton's Honors Program, the Special Jesuit Liberal Arts Honors Program, and the School of Management's Business Leadership Program. Dr. Klonoski has given many scholarly presentations and has published extensively. His several articles have appeared in such journals as Tulane Studies in Philosophy, The Journal of Business Ethics, The Classical Journal, Ancient World, Classical Outlook, Contemporary Philosophy, Business Horizons, Between the Species, CLIO, Health Care Management Review, The McNesse Review, History of Political Thought, Teaching Business Ethics, The Journal of Educational Thought, the International Journal of Ethics, and the Global Studies Journal. His book with Thomas M. Garrett, Business Ethics, 2nd ed. Prentice-Hall, 1986, was in print for ten years and has been translated into Ukrainian and was published in Ukraine by Osnovy Publishers in 1997. An article on child labor, one of his current interests, appeared in the recent book on business ethics, Fulfilling Our Obligation: Perspectives on Teaching Business Ethics (2005). Dr. Klonoski currently serves on the Editorial Advisory Board of the International Journal of Ethics. In 1986 Dr. Klonoski received the Alpha Sigma Nu Award for Excellence in Teaching. In 1990 he was selected to participate in the North Carolina Center for Independent Higher Education's Visiting Scholars Program and in 1998 in the Loras College Classical Philosophy Lecture Series. Also in 1998 the graduating class at the University of Scranton voted Dr. Klonoski "Teacher of the Year" and presented him with the Faculty Senate Award for Excellence in Teaching. Dr. Klonoski has also been the recipient of several awards for Community Service from the Arthritis Foundation and the American Juvenile Arthritis Organization.